Respironics BiPAP One 60 Series- Presenting you a machine that delivers excellent results for those who suffer from Obstructive Sleep Apnea, or shortly known as OSA. This respironics BiPAP device is a machine that provides optimal BiPAP therapy by using innovative and state of art technology. The One 60 Series respironics BiPAP features innovative technologies which improve the user overall therapy experience. Designed for providing more comfort and flexibility for the users, the respironics BiPAP One 60 Series includes smart upgrades and features for providing ideal BiPAP therapy which is more natural. Humidification Management That Combines Humidity And Warmth. By combining better performance and maximized comfort with more effective and robust humidification, the respironics BiPAP One 60 Series improves significantly the users BiPAP experience. This device delivers ideal humidity by using humidity sensor and matching the ambient temperature with the temperature at the heated tube. Optimal temperature and humidity levels during the night contribute towards better BiPAP therapy experience. Higher humidity levels can be created thanks to the 5 different temperature settings. Bi-Flex Pressure Relief Technology. The clinically tested respironics BiPAP One 60 Series enhance the comfort by matching the pressure level with the patient natural breathing process. This innovative technology provides ideal relief from pressure at three points of the breathing process: the transition from inhalation to exhalation, the transition from exhalation to inhalation, and during exhalation. By minimizing the pressure during the transition from exhalation to inhalation, the respironics BiPAP allows the patient to breathe naturally. Furthermore, by matching the patient breathing needs, the respironics BiPAP One 60 Series provides the right pressure relief. More Quiet Nights With The WhisperSmart Technology. Noisy BiPAP machines create negative BiPAP therapy experience for the users. With the respironics BiPAP One 60 Series, both the patient and bed partner can sleep more comfortably thanks to the innovative WhisperSmart technology. 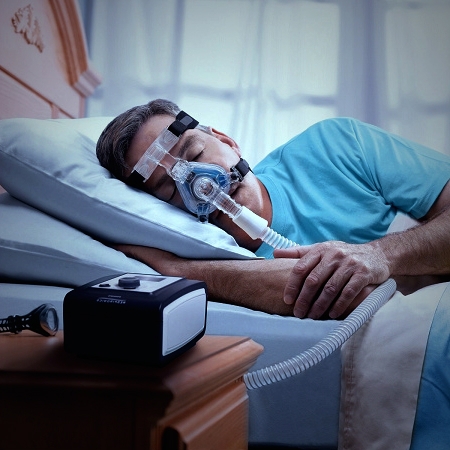 The respironics BiPAP WhisperSmart technology minimize the noise, making the device quiet at night. Advanced Data Storage. The repironics BiPAP One 60 Series addresses and stores important sleep parameters for keeping the patient informed all the time about the BiPAP therapy. As a result, optimal BiPAP therapy can be designed that will satisfy the user specific needs. What is more important, this device can identify critical symptoms and inform the user for a specific breathing treatment. Water Resistant Machine. With innovative Dry Box technology, the repironics BiPAP is highly water resistant machine. The risk of water coming into the machine is completely eliminated. The new water chamber can be tilted or pulled upside down without a risk of water leaking into the machine. Even if small amount of water leaks into the chamber, the innovative Dry Box technology prevents further leaking.